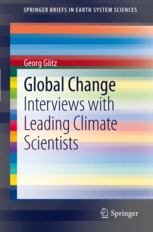 Springer Verlag has published a collection of interviews done by Georg Götz: Global Change - Interviews with Leading Climate Scientists (53 p), Softcover, ISBN 978-3-642-23443-9. Interviewed are Hans Oerlemans, Hans von Storch, Erland Källén, Andrew Weaver, Martin Parry, Stéphane Hallegatte and Donald Hughes. The interview with Hans von Storch was published with the title "We always make models for something not of something" - about dynamical modelling, parameterizations and postnormality. The interview was taped in late 2010, and authorized in February 2011.
around. And then he tries to adjust his model to agree with the other 17 models. There is also a social process that leads to the agreement between all the different climate models." Can you make an estimate of the amount of adjustment that takes place for 'social' reasons? DR-UK/1 - no, I can not. There was, however, an episode - was likely around AR3 or 4, when some "new" models came into the system which showed somewhat different results; the authors later modified their models so that they were more consistent with the rest of the group. Obviously, when results are presented at conferences, and very different results emerge, people begin to wonder what the reason may be - almost always because of different parameterizations of certain subgrid-scale processes. In the following discussion a (for science: normal) converging process usually emerges towards consistency of the different approaches. At a mostly technical level. That's my perception. Thank you for replying so quickly. I can see that process leads towards "consistent" models but does it lead to "correct" ones? Are some models or parameterizations agreed to be better than others?